Inventory We are a resale marketplace, not a box office or venue. Ticket prices may exceed face value. This site is not owned by DAR Constitution Hall . DAR Constitution Hall was built in 1929 as a congregational place for the annual Daughters of the American Revolution conventions. 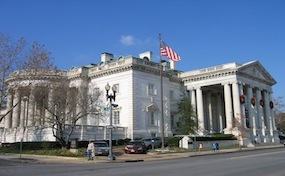 DAR Constitution Hall is located at 1776 D Street Northwest in Washington, DC. The DAR Constitution Hall box office has a capacity of 3,702. The hall is currently used for concerts, conferences, meetings, televised events, and other performances. DAR Constitution Hall Tickets have included Mr. Smith goes to Washington, Whitney Houston, Chris Rock, Jeopardy, Wheel of Fortune, Robin Williams, and more. The cornerstone for the DAR Constitution Hall was laid using the same trowel as George Washington at the Capitol by Mrs. Calvin Coolidge. As a rite of passage, every President since Coolidge has attended shows at DAR Constitution Hall. Until the 1950’s, the hall had a class ceiling providing a view of the stars. The venue also played a key part in war propaganda during World War Two, being set up as a base of operation for the Red Cross to support the war effort. The hall has been a landmark location throughout Washington D.C.’s history. ConstitutionhallWashingtonDC.com is not affiliated with any primary box office or supplier. We are a privately owned and operated business specializing in sales in the secondary market. To buy tickets for any DAR Constitution Hall events in Washington DC simply click on the event of interest or call our operators at anytime.